In Minnesota, Oxytropis viscida is restricted to a single cliff in Cook County. The population was originally discovered in 1938 and still persists. Such a small, isolated population is vulnerable to a variety of stochastic processes attributable to natural events and human-caused impacts. 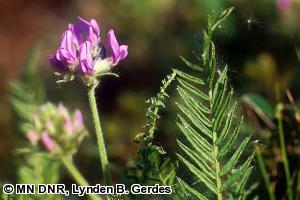 For this reason, Oxytropis viscida was listed as an endangered species in Minnesota in 1996. This small, stemless legume has a thick taproot and numerous basal, divided leaves each with 15-25 pairs of linear leaflets. Leaves are opposite, scattered, and variously pubescent. Flowers of Minnesota plants are generally purple, but elsewhere they can vary from whitish to blue. Oxytropis viscida is unique within its genus by virtue of its viscid (sticky with glandular warts) bracts and inflorescence. Its bracts are glabrous or nearly glabrous. There is no other species in the forested region of Minnesota that has the general appearance of this plant (Gleason and Cronquist 1991). The Minnesota plants differ morphologically from the original description of this species and they are geographically separated by at least 950 km (590 mi.) from the main range of the species. For these reasons, Butters and Abbe (1943) initially thought this was a new species, and named it O. ixodes. More recently, botanists have determined that the Minnesota plants are not a distinct species after all. They are part of the O. viscida complex, which is quite variable and widespread. The Minnesota O. viscida population occurs on a single, north to northwest facing cliff face and at the top of the corresponding talus slope. Plants occur in both sunny and partially shaded conditions where there is little competition from typical forest species; this is similar to the habitat occupied by the species in the Rocky Mountains. This population is apparently a relict of a wider, preglacial distribution. Oxytropis viscida is a perennial, leguminous herb with usually dehiscent, dry fruits. The flowers appear in late May and June, and are pollinated by insects, including moths and butterflies. The best time to search for O. viscida is when it is in flower from late May through June, but it can be reliably identified from May to September. The Minnesota O. viscida population may be affected by natural erosion and dislocation of the unstable cliffs and talus that this species inhabits. This is a natural process that will probably not threaten the population unless the number of individual plants get too small. However, land alterations to the adjacent cliff-top forest could increase erosion, competition, and the occurrence of non-native species. Such increases could create an unnatural level of instability, further limiting available habitat and undermining the plants themselves. The increasing popularity of rock climbing and off-trail hiking to scenic overlooks at the top of the cliff could also negatively impact this species' habitat. In fact, some plants have already been damaged by this activity. The upper cliff zone and adjacent outcrop/woodland is very vulnerable to trampling, especially in dry periods when the abundant lichens and sparse vegetation are extremely brittle. Nearby trails, including previously closed trails, will need to be monitored and maintained. The development and implementation of a formal monitoring program for O. viscida is strongly warranted. A conservation plan should also be developed with the site's landowners to help assure and guide long-term conservation of the site. Butters, F. K., and E. C. Abbe. 1943. A new Oxytrope of the Minnesota-Ontario border. Rhodora 45:1-4.